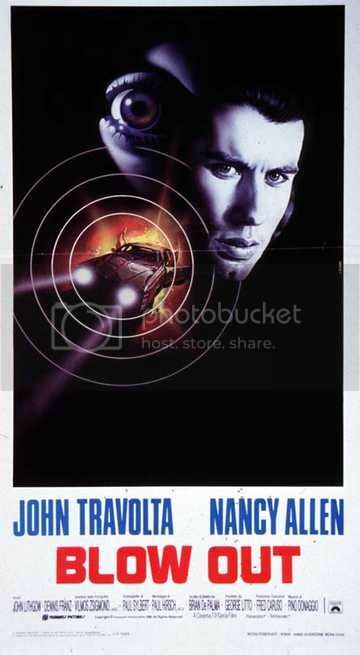 Criminally underated Brian De Palma film, excellent performances by John Travolta and Nancy Allen, any fans out there? I have it on Laserdisc & still watch it whenever I catch it on TV. I'm a fan too. I like Body Double just a bit more, but I love Blow Out too. It's a very suspenseful and masterfully crafted thriller, but also a protest against the American politics in that time, and above all it's a reflection on and an ode to movie making! The opening scene, a parody on the slasher-genre, is one of my favourite scenes of all time... ironically, this single scene has more quality than any other slasher (except for the opening of Halloween maybe). i found the ending a bit bizzare, good but bizzare, i prefer body double too. You mean the "it's a good scream" scene? I thought that was beautiful. A broken man's kind of morbid but touching homage to the woman he loved. Also it may be an action to punish himself because he feels so guilty. I recalled that this is a good movie but it was much better. Almost a masterpiece. Loved the movie within a movie opening and all those quiet scenes, Travolta doing his stuff. Lots of familiar De Palma faces among the cast and they all did a fantastic job. All the usual camera tricks are here, Vilmos Zsigmond did the cinematography and Pino Donaggio composed the score. He also has some pop influences this time and it sounds awesome. The Arrow blu includes career spanning Donaggio interview which was a nice surprise. I revisited this for the first time in a while the other year when i got the Arrow Blu Ray through on rental and it's such a fantastic movie with Travolta at his best,i would have to say that this is probably one of my favourites​ or if not my very favourite of De palma's movies! Plus i would have loved to have watched this in the theatres when it first showed as i bet you could have heard a pin drop after that shock ending! Blow out is a good suspense flick and yes, I agree, pretty underrated. It's probably 3rd on my list of favorite De Palma suspense films behind Body Double and Carrie. And the fantastic movie score by Pino Donaggio is worth mentioning again too. Donaggio scores in De Palma films were some of the best in the 80's. That's why they worked together on several films. They were pretty much equal to the team of Tim Burton/Danny Elfman with how well they meshed together on screen. Blow Out is one of my favorite films, and one of top five favorite De Palma movies. Intense, suspenseful, with a kind of neo-noir "vibe" to some extent. Being a huge movie fan, it was cool to see the Travolta character play a sound tech. on low-budget films. Obviously the car crashing into the water at the beginning of the film was "inspired" by the real-life event that occurred in the early '70's, involving a famous politician. "Blow Out" is a great film. I'm not a big fan of Travolta, but he was excellent in this. I might have to watch it tonight. It's a masterpiece and the best DePalma film. (Though Carlito's Way is a very close second.) I saw it in a theater on opening day with about six other people. I'm not sure the rest of the "crowd" understood the significance of one of cinema's most deeply depressing and profound endings. I think Travolta has never been better, including his Oscar nominated performances. And the last scene of him is simply unforgettable, such powerful acting. You know his character, now just a destroyed shell of a human being, will be hearing that in his head for the rest of his life. I dare anyone not to be moved.